The first bit of proper fabrication on the Quilt Rack was to joint the feet to the legs. I did this using my Domino XL. In order to accommodate the curves they would later be shaped to, I had to use different length Dominos. This is the first time I’ve used the XL. It’s a wonderful beast. Given the size (and especially the length) of the available 14 mm Dominos, the feet should stay attached to the legs for a very long time. Those Dominos for the Domino XL are awfully big. After the Dominos were mortised I assembled the leg/foot assemblies and clamped them each up with a single parallel clamp. I handled glue squeeze out using the method advocated by Marc Spagnolo, waiting about 20 minute and scraping it off after it’s initially gelled. My roofing Barret knife makes is a great all around knife. Once the leg/foot assemblies came out of the clamps, I transferred the cross member locations to the boards using my stop rules. I didn’t actually mark or transfer the Domino mortise locations, just the outline of the square (not yet rounded) cross members. Stop rules were used to transfer the cross member locations. To mill the Domino mortises in the legs, I clamped a piece of wood to the leg even with the edge of the cross member to act as a fence. Then I set the base of the domino against the fence, centered it on the width of the cross member and mortised. To mortise the cross members, I used the Domino Trim Stop for Narrow Stock. Because the legs are only about ⅞” thick, I made the mortise deeper in the cross member than in the leg. I clamped a block of wood to the leg to act as a fence to reference the Domino off of. 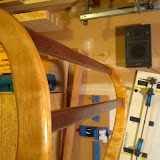 With the joinery done, Part III will move on to shaping.